The very last presentation I sat in on at SUNY CIT focused on a topic for which we just received an IITG grant—GIS. GIS is a geographic information system. Basically, you can overlay information visually on a map. Mary Perrelli from Buffalo State College gave this informative presentation. One of the goals for each module is to help students think spatially. Additionally, the modules help to develop computer skills and job-related skills. Each of the course modules is a PDF providing step-by-step instructions for learning a new GIS skill. The module also contains exploration points for students to practice their skills. The Buffalo State GIS team has developed a process to create course modules. Meet with the faculty to review syllabus, goals, and course outcomes. Share activity ideas back and forth until they have decided upon a set to use in a class. GIS team will then develop the module. The module is then sent to faculty for review and revision. As the team developed the process, a couple of lessons were learned. Data manipulation may be needed. Having students manipulate data may not be appropriate for some classes. Faculty must decide upon the learning objective. In some cases, students will only be learning how to interpret the final result whereas other students may need to learn data collection strategies. Faculty may not have the experience to work with GIS tools. They will need training appropriate for the skills they are sharing with students. They have plans to partner with local high schools. Additionally, they will continue to create modules for other disciplines. This was a great presentation to end the conference with. It provides a jumping off point for our IITG grant project. It is also convenient that Buffalo State College is just up the road from us. If you would like to know more about this presentation, please stop by the TEI Synergy Center and I will show you what Mary showed me. 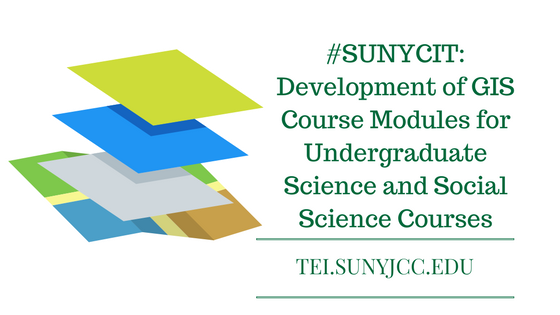 #SUNYCIT: Information Literacy Skills – Whose Job is it, Anyhow? Google Maps to the Rescue!